When Mr. Prospector went to stud in 1975 at Aisco Stud in Florida, the local breeders were quite excited to have such a well regarded new stallion available to them. Hall of Fame trainer John Nerud, the man responsible for the breeding suggestions for the powerful Tartan Farms as well as his own bloodstock, was no exception. When he evaluated Mr. Prospector he deduced that he might have the perfect mare for him. Killaloe by Dr. Fager was foaled the same year as Mr. Prospector and was a winner of four races from thirty-two starts. She placed in nine and had seven additional thirds from these starts. She did not earn any black type. Her breeding was top notch though as she was a granddaughter of Tartan Farms foundation mare Cequillo, and was sired by Tartan’s great champion Dr. Fager. Nerud was convinced that Killaloe would be a very good match for Mr. Prospector. This proposed mating would take some convincing by Nerud to Mr. P’s owner Butch Savin as it was now quite late in the 1976 breeding season and Savin was reluctant to breeding late foals. A booking was dully set-up and the following year on May 19, 1977 a bay colt was foaled by the daughter of Dr. Fager. The colt would be named Fappiano, in honour of sportswriter Giuseppe Fappiano, who wrote under the pseudonym Joseph C. Nichols. Fappiano grew to look more like his dam sire than his own sire. He was described as “A powerful blood bay with wonderful deep shoulders, a fiery eye, and off set knees”. In other words he had Dr. Fager’s body and look, with Mr. Prospector’s legs. Jan Nerud, the son of John, would train the colt for his father. Fappiano made four starts as a two year old, winning all which includes a victory in the Morven Stakes in a sizzling 1:08.3/5. He was a winter book hopeful for the 1980 Kentucky Derby but the Nerud’s are not ones to rush a colt for the chance at glory. He would return at three and capture the nine furlong Discovery Handicap (G3) and second in the one mile Jerome Handicap and nine furlongs Paterson Handicap. The latter races are both grade twos. He won three of seven starts as a three year old. At four, Fappiano won three of six events including the one mile Forego Handicap, beating that year’s champion sprinter Guilty Conscience and a resounding win in the grade one Metropolitan Handicap in the fast time of 1:33.4 for the mile distance. Fappiano was retired at the end of the year with a very solid race record of ten wins from seventeen starts and placing second four times. Fappiano began his stud career at his birth place Tartan Farms in Ocala Florida. He would establish himself, in quick order, as the first son of Mr. Prospector to be a sire of top class stakes winners, and a worthy heir of continuing the tail male line. In his first crop was Tasso, winner of the Breeder’s Cup Juvenile and later named the Eclipse Award champion two year old. Tasso would also win the Del Mar Futurity and the Breeder’s Futurity during his two year old campaign. Other stakes winners from the 1983 foal crop were With A Twist, Waikiki Star, Mustin Lake, and Funistrada. The next crop of foals sired by Fappiano contained grade one winners Cryptoclearance and Tappiano, a daughter of Taminette who in turn is a daughter of the good foundation mare Tamarett. This is the family of Tentam, Known Fact and Gone West. Cryptoclearance went on to have a successful life at stud siring Belmont Stakes winner Victory Gallop, Volponi who won the Breeder’s Cup Classic, as well as Ride The Rails, sire of current top sire Candy Ride, who was bred in Argentina and brought to the U.S.
Quiet American form the 1986 crop by Fappiano has become a major asset to the sire line legacy. Quiet American’s dam was Demure by Dr. Fager which means he was closely inbred 3×2 to Dr. Fager. Furthermore Cequillo is the third dam of Demure so Quiet American is also inbred to her 4×3. Quiet American became a grade one stakes winner when he scored in the NYRA Mile Handicap, as well as a sire of a duel classic winner in Real Quiet (Kentucky Derby and Preakness Stakes). Quiet American, who was pensioned from stud duty in 2013, also sired grade one stakes winners Seattle Smooth, Switch, Warrior Queen as well as champion Hidden Lake. Cara Rafaela won the Hollywood Starlet Stakes and is the dam of champion Bernardini. Quiet American’s daughter Quiet Dance, a direct female line descendant of Gallorette, is the dam of champion Saint Liam. Other grade one stakes winners sired by Fappiano are, Some Romance (Frizette Stakes, Matron Stakes), Grand Canyon (Hollywood Futurity, Norfolk Stakes), Serape (Ballerina Stakes), Apostar (Acorn Stakes), Defensive Play (Man O’ War Stakes, Charles H. Stub Stakes), and Cahill Road (Wood Memorial). Another notable grade one winner by Fappiano is Rubiano (Champion Sprinter, NYRA Mile, Vosburgh Stakes, Carter Handicap) who is also the dam sire of current hot young sire War Front, and Roy who was not a major stakes winner but has stood stud successfully in Chile, Argentina, Brazil and the U.S. Roy is a nine time leading sire in Chile and twice led the Argentine list. A full brother to Cahill Road was foaled a year before the Wood Memorial winner, his name is Unbridled. Unbridled was bred by Tartan Farms in 1987 and subsequently purchased later that year when still a weanling by Mrs. Francis A Genter, a close friend of the Tartan Farms group. The purchase was made at the dispersal of the farm’s stock. Unbridled would be the big horse that all breeders look for, and was the crowning achievement to the Fappiano legacy. He was the Eclipse Champion three year old of 1990 when he won the Kentucky Derby, Florida Derby and the Breeder’s Cup Classic. Unbridled won a grand total of $4,489,475 in life time earnings on the track. In bred 4×4 to another Tartan Farms foundation mare Aspidistra, Unbridled was by Fappiano- Gana Facil by Le Fabuleux. Gana Facil is a direct female line descendant of Aspidistra. Unbridled became a very successful stallion, standing stud first at Gainesway and then Claiborne Farm in Kentucky. Unbridled established himself as a very popular and highly successful sire. Among his best were, Red Bullet (Preakness Stakes), Empire Maker (Belmont Stakes, sire of Royal Delta and Bodemeister), Anees (Breeder’s Cup Juvenile), Broken Vow (Philip Iselin Handicap and a successful sire today), Grindstone (Kentucky Derby, sire of Birdstone, who in turn sired Mine That Bird and Summer Bird). Unbridled’s Song (Breeder’s Cup Juvenile, Wood Memorial, Florida Derby) would be a big success at stud siring champion two year old colt Midshipman, Unrivaled Belle, Unbridled Elaine (all winners of Breeder’s Cup events), Canadian champion mare Embur’s Song, Graydar (Donn Handicap), among his over one-hundred stakes winners. Unbridled’s Song passed away July 26, 2013 after standing seventeen seasons at Taylor-Made Farm in Kentucky. Unbridled has been a strong source of stakes winners and Fappiano’s best son as a sire. Another further indication of the influence of Unbridled, and of course Fappiano, are Unbridled’s daughters Lady Liberty (dam of Kentucky Derby winner Orb), and Tap Your Heels, the dam of current reigning champion sire Tapit. Tap Your Heels is out of Ruby Slippers, the dam of champion Rubiano by Fappiano. Unbridled died of colic at the young age of fourteen, but achieved a great deal of success in his all too short life. As Mr. Prospector had, Fappiano would also relocated to a famous Kentucky stallion farm. 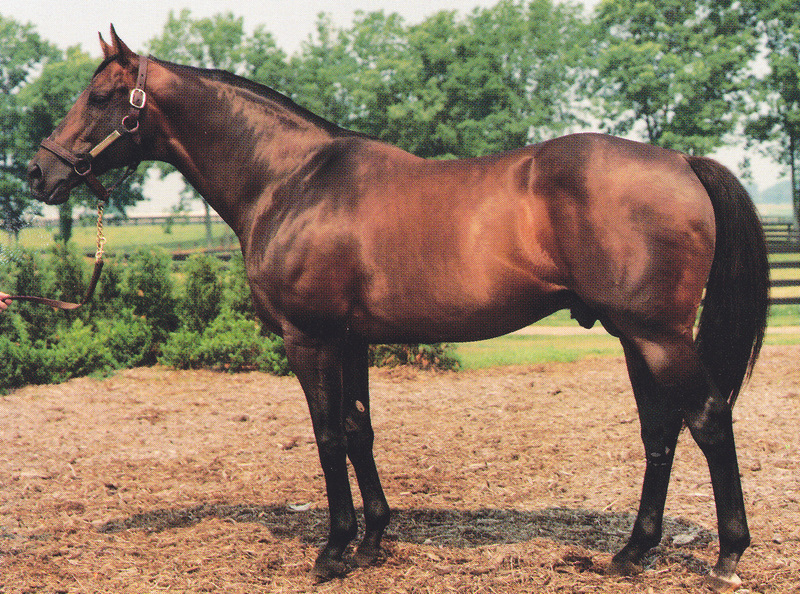 Fappiano went to Lane’s End Farm in Kentucky in 1987, after he sired his sixth crop in Florida. He sired three crops at Lane’s End until his death from chronic laminitis, which was brought on from a serious leg fracture earlier in the year. Oddly, and in the face of general wisdom, Fappiano had more success in Florida than he did in Kentucky as he never sired a grade one winner while standing in the bluegrass state. Fappiano sired four-hundred and ten foals of which forty-eight were stakes winners, an 11.7% strike rate which is very successful. He sired champions and influential sires as well as influential broodmares that have kept his place in the pedigrees of some of the top runners currently seen today. In his short thirteen year life, Fappiano achieved more than most thoroughbreds achieved in a life span double to his. Fappiano is, in this writer’s opinion, the most influential of all of Mr. Prospector’s many successful sons at stud. Fappiano was the culmination of a very intelligent and successful Floridian breeding program instituted by Tartan Farms and the genius of John Nerud. Thank you for all the information and awesome article! !